The first General Purposes Committee of my year was on Tuesday 25th September. This is the meeting that brings together all the committee chairmen so that reports, decisions and recommendations can be reviewed before they are presented to the Court for approval or discussion. The GP Committee tries not to refer to the Court anything that will get outright rejection, so it needs a skilful chairman and I am grateful for Past Master Jeremy Randall for handling matters so well. That evening I went to the RAF Club in Piccadilly to hear a lecture organised by the Company of Air Pilots on the UK’s Reaper Force, i.e. the pilotless aircraft (we were told never to use the term ‘drones’) that the RAF operate in the Middle East. Wing Commander Mark Jackson, the officer commanding one of the RAF’s two Reaper squadrons, was a little inhibited by not being allowed to reveal too much secret information, but we did get an insight into the extraordinary world of ‘remote’ operations. Each aircraft has a ‘crew’ of three who sit in a small pod cluster: the pilot, the weapons controller, and an intelligence co-ordinator who interprets and assesses the information gathered. The aircraft can fly for more than twelve hours, so control of any single mission may move from the launch crew (in the Middle East) to alternating crews based in Lincolnshire UK or Nevada, USA depending on the time of day. We left the lecture reeling with the complexity of it all and moved to a very welcome reception on more familiar territory. On Wednesday, I attended the quarterly meeting of the Company’s Communications Working Party which oversees the website and the various publications such as the Annual Report. Thursday was a visit, along with many of the Masters and Clerks of the City companies, to the recently refurbished National Army Museum in Chelsea. We were welcomed by the new director, Brigadier Justin Maciejewski, and then invited to visit the current exhibitions, quite a task in the limited time available because they are so extensive. This year the formal dinner was held at the Red Lion Hotel. After a day’s strenuous activity there was an appropriately substantial roast beef dinner enjoyed by nearly forty Apprentices, Freemen and their partners. The races for the Ben Woolacott Sculls took place on the Sunday morning under the supervision of Past Master Simon McCarthy. The eventual finishing order was: first Jimmy Anderson, second James Berry, and third Matthew Brooks. The sculler deemed to be the most improved over the weekend was James Berry. The prizes will be awarded at the Doggett’s Emblem evening in February when we hope to see a good turnout. Monday 1st October was the Common Hall, when the new Lord Mayor of London is elected. Because the Company is not Livery we have no official involvement, but I was invited by our caterer Mark Grove to attend a breakfast at Guildhall with many other Masters and their Clerks. At 10am the Livery Masters all disappeared to gown up for the church service and then to process with the Lord Mayor into the Great Hall. Our Beadle Tony Parker and I were able to watch the impressive ceremony in comfort via CCTV on the giant screen in the Old Library. On Tuesday 2nd, Susan and I were invited by the Society for Sailing Barge Research to the launch of a book at the Thameside Complex in Grays. Also attending was the Company’s archivist Susan Fenwick, who had helped with the research for the book Goldsmith of Greys: the Pickfords of the North Sea. 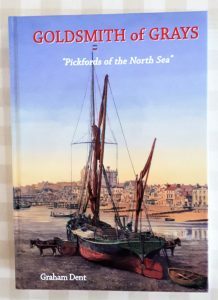 The significance of the book to the Watermen & Lightermen is that the Goldsmith family provided three Masters to the Company: in 1896, 1930 and 1947. Confusingly the family tradition required that all were named “E.J. Goldsmith”. They operated a fleet lighterage company out of Grays from 1833 to around 1952 and the three Goldsmith Masters covered a very interesting period of the Company’s history. The first in 1896 coming just after the Dock Strike of 1889, and the last in the period of dockland revitalisation after the Second World War. On behalf of the Company I accepted an inscribed copy of the book from the Society, which, being the history of the family, firm and fleet, will be a useful addition to the Hall’s library. I chaired the first Court meeting of my year on Wednesday 3rd and, despite signals from the Clerk that I was going too slowly through the agenda, we emerged just about in time for lunch. The guest speaker was Mickola Wilson, now a very senior property fund manager whose appointments include being a non-executive Director the Government Property Agency. She is also a Past Master of the Worshipful Company of Chartered Surveyors. However, back in the 1970s and the reason for her being our guest speaker, she was a very junior surveyor and a key member of the team that developed St. Mary at Hill and Lovat Lane. She could remember when much of the area was still bombsites and abandoned warehouses, and had been much involved in the expansion of the original Watermen’s Hall to include the neighbouring building which today incorporates the offices and the Freemen’s Room. She was a very amusing speaker and recounted how on one occasion a property marketing lunch had brought together the dance troupe Pan’s People and the Court of the Company of Watermen & Lightermen. She had been unsure whether the two would mix – but the outcome was that the promoted property had been let the same afternoon. There were only two more engagements in my week: The Master and Clerks’ Luncheon organised by the Worshipful Company of Lightmongers at Tallow Chandlers Hall, and the Installation Dinner of the Worshipful Company of Feltmakers at Haberdashers Hall. At the Lightmongers’ lunch I was seated next to the Master of the Environmental Cleaners and we discussed the challenges of creating a government approved apprenticeship scheme. The Environmental Cleaners have been trying to establish one for some years but every proposal has been rebuffed, despite the hazards of the machinery and chemicals involved in environmental cleaning work. On my right I had a Lightmonger whose company had made contract lighting for stations, public areas and prisons. He described how the specification for the latter had included that the fittings must be capable of resisting assault with a chair leg, and the nervousness of watching a burly prison warden do a practical test of this feature.